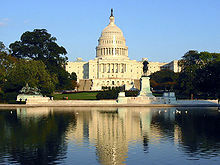 The United States Congress is the legislature of the United States federal government. It is bicameral, comprising the House of Representatives and the Senate. The House of Representatives has 435 voting members (plus non-voting delegates), each representing a congressional district and serving a two-year term. House seats are apportioned among the states on the basis of population. Each state has two Senators, regardless of population. There are 100 senators, serving staggered six-year terms. Every two years, approximately 1/3 of the Senate is elected. Both Senators and Representatives are chosen through direct election. United States Statutes at Large, a compendium of all Acts of Congress. United States Code, the codification of most Acts.